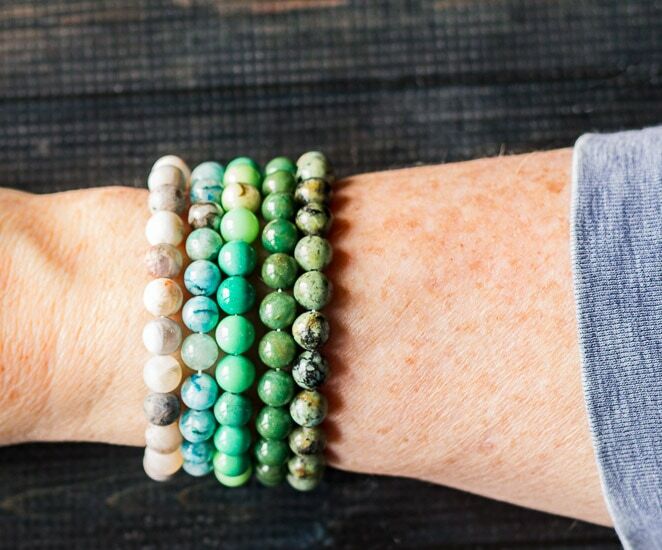 Healing stone bracelets are easy and inexpensive to make. Even though they are said to have healing properties, their natural beauty is a gift in itself. 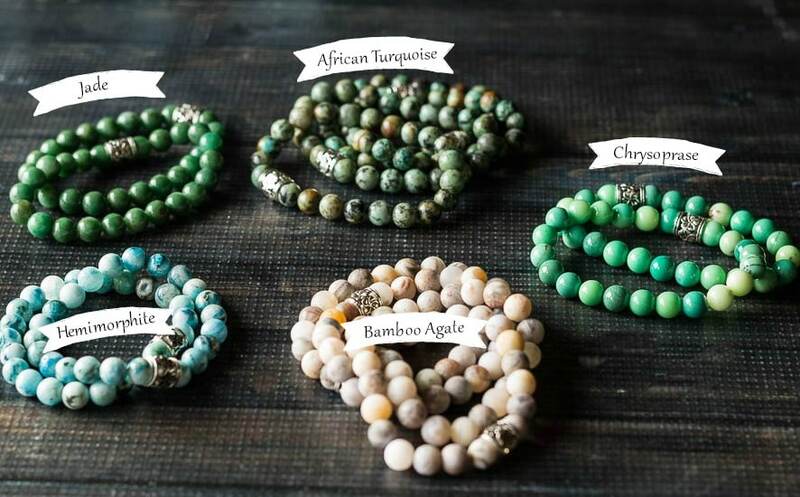 I love the look of these beautiful natural stone beads. They are said to have special healing properties. I’m not so sure that I believe that they do, however, they sure are pretty enough to wear, and the healing properties idea is just an added bonus. Measure your wrist. Since this is elastic, it should fit most people. Add one inch to your wrist size. Mine was 6 inches so I created all the bracelets at seven inches long. Cut a piece of the elastic thread around 12 inches long so you have plenty of room to work with. Use a paperclip at one end to keep the beads from falling off. You can also tie a different bead on the end, but I found it hard to keep it in place. 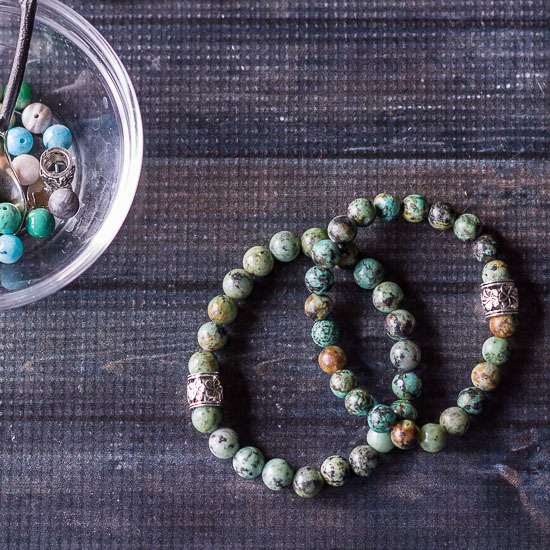 String your beads onto the thread. I used 22 (8mm) beads for these bracelets. Add your spacer bead at the end. Remove the paperclip and tie the ends of the elastic thread tightly making several knots. 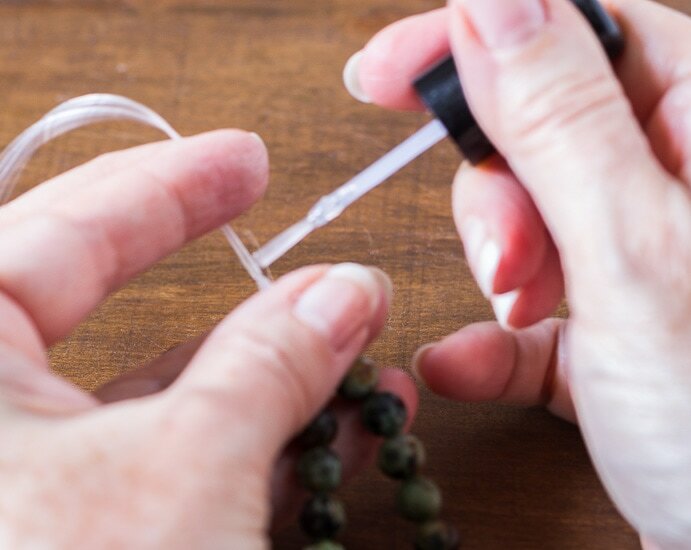 Secure the knots with a little super glue or clear nail polish. Hold it while it dries. Cut the excess thread and move the knots under the spacer bead. I ended up using 22 beads for each bracelet. If you buy a different size you can lay it out against a measuring tape or ruler, as shown above, to determine the right amount of beads. Since the packets came with about 45 beads, I was able to make two bracelets from each order. I used clear nail polish but many people use super glue. The hardest part was waiting and blowing on it to dry fast because you have to hold the elastic out from the beads to dry. Here are the beads I purchased to make for my family and friends. I’ll be honest. I chose them all for their looks. However, when you look up their meanings and properties, they are all positive. My favorite stones were these African Turquoise beads. I love the speckled variation in color. They are all quite pretty and there are several others to chose from online. The craft stores sell all kinds of beads too. I’m not sure if they are gemstones, however, regular ceramic beads can be just as pretty and fun to make. Thanks Mary. That was my daughter’s favorite too.